This new publication from AJ Press Publications is in this publisher usual A4 size format and contains 82 pages of exceptional detail. The text is supplied in both English and Polish. The quality of paper, photographs and printing is excellent. A brief history of the development of the Mustang is included in the first few pages. The publication contains many photographs with the majority being printed in colour. There are some very in detail walk around photographs of many preserved aircraft. These will be of great benefit to the super detailers as there are some very close photographs of the undercarriage, undercarriage bays, engine and cockpit. Many detailed 1/72 and 1/48 scale line drawings are included and there is even a full cutaway illustration in line drawing and illustration. 9 colour side profiles displaying different schemes worn by various squadrons. A section of complete reviews of the major kits available in 1/72, 1/48, 1/32 and 1/24 has also been included with the main focus of this being on the 1/24 scale Trumpeter kit. A complete list of accessories in these scales is also provided. 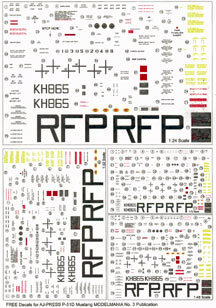 AJ Press has included a concise A4 size sheet of data decals for all scales and these include the serial no and codes (RF-P) for a Mustang of the No 303 Polish Sqn RAF based at RAF Andrews Field in April 1945. The decals are crisply printed and are printed onto a very thin carrier film. 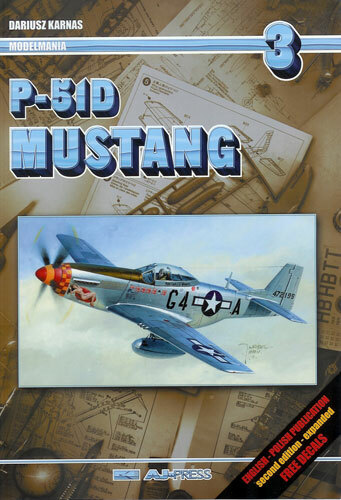 In summary, this is a very concise and complete reference for any modeler wanting to build a P-51D Mustang.